Lauren and I went to the movies over the holidays with her brothers, and since Lauren’s brothers love football, a movie about football seemed the logical choice. I’m not much of a football man myself. I like the sport; I just don’t like it enough to make time for it. At any rate, I was up for a football movie. 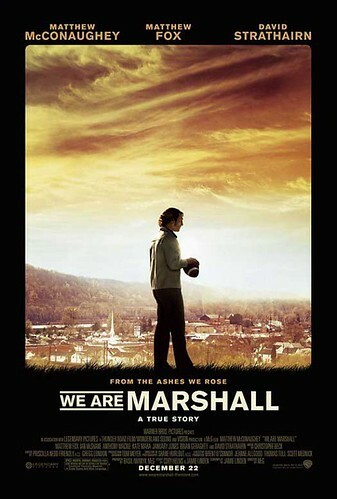 We Are Marshall is the true story of the death and rebirth of the Marshall University football team. In 1970, following a game with ECU, the Marshall team flew back to West Virginia in a chartered plane. Practically everyone was aboard: the coaching staff, the players themselves, other school personnel. Tragically, the plane went down just before landing, killing everyone aboard. The subsequent fire was so severe that six of the players were burned beyond recognition and now lie together in six unmarked graves by a monument honoring the dead. For a small town, it was a terrible, crippling tragedy. Children lost their fathers. Wives lost their husbands. Young, starry eyed girls lost their fiancés. It was awful. So awful in fact, that the school decided to suspend the football program altogether. And there is where the real story begins. Four team members survived the tragedy. They weren’t on the plane. They had missed the game and flight because of injury or oversleeping. And the only member of the coaching staff who survived, played wonderfully by LOST star Matthew Fox, was supposed to be on the plane but did another coach a favor by taking a car instead. His survival was an ironic twist of fate that left the man consumed with guilt and nearly broken. When the school decides to suspend the football program, three of these four remaining players rally the other students and convince the administrative council to reconsider. Enter Matthew McConaughey. To resurrect the program, Marshall needs a new head coach, and McConaughey plays the coach of a rather obscure school in Ohio who volunteers for the job. As it turns out, he’s a delightfully down-to-earth, somewhat eccentric character, and McConaughey plays him proud and loud, talking out of the side of his mouth – as the real character must have done – walking in a slightly stooped fashion, and cracking odd jokes that make him adorably weird. The rest of the cast was equally amazing. David Strathairn was great as the kindly university president clearly over his head after the tragedy. Ian McShane (Deadwood) was appropriately stiff and immovable as a father grieving the loss of his only son. But the actor who surprised me the most was Anthony Mackie, the team captain who survived the original crash because of a shoulder injury and who now feels the weight of the world upon him as he struggles single handedly to restore the team to its former glory. The locker-room scene in which McConaughey informs Mackie — despite Mackie’s objections to the contrary — that he’s too injured to play in the upcoming game is electric. Powerful stuff. Real, from-the-gut performance. I was floored and moved. But what I loved most about the film was how incredibly honest it felt. It didn’t sugar coat the team’s awful record that followed the tragedy. It didn’t lead us to believe that all was right in the world at the film’s conclusion. The bereaved father was still bereaving in the end. The broken assistant coach was still, for the most part, broken. And the university president, who lost his job for his decisions, was NOT restored to his position and showered with apologies as Hollywood contrived stories would have done. And yet despite this raw honesty, despite the film’s acknowledgment that some wounds can’t heal, there is a happy ending. Marshall University does experience a brief flash of greatness, a cleansing, a restitution, a rising out of the grief and guilt that had consumed them. And for that reason I loved the film. The story felt true. It felt real. The school did just as the movie poster suggested: it rose from the ashes.